Wow. I just realized that my macarons post was my 100th post. I suppose it’s fitting that I included a more temperamental dessert in a milestone post, rather than the flop I’m posting today. I’m quite embarrassed to post the picture, as everything about the dish turned out that bad. But, flops happen. And I promised to post what I did with the leftovers of Project Chicken, so there was no getting out of this one. I confess that I usually buy a gourmet spicy peanut sauce from a local specialty shop. The sauce is delicious, the price is decent, and I don’t have to stock 10 bottles of various Asian sauce components in my fridge. I make these sauces so rarely that the ingredients always seem to go bad before I get around to using everything up. The purchased peanut sauce, however, gets used up every time. Well, this time I made my own sauce, following a recipe I found here. I had all of the ingredients, but I chose to forego the pasta and just do chicken with vegetables. At that point in the week, I really needed to use up that chicken, and having a bunch of leftovers was not ideal, since I wouldn’t be able to eat them anyway. In a bowl, whisk together the peanut butter, soy sauce, garlic, chili sauce, and ginger. Heat oil in a wok or large saute pan (preferrably non-stick) over medium-high heat. Add vegetables and saute until tender. Add chicken and saute for a minute to warm through. Reduce heat to medium-low and add peanut sauce. Thin with water to desired consistency. 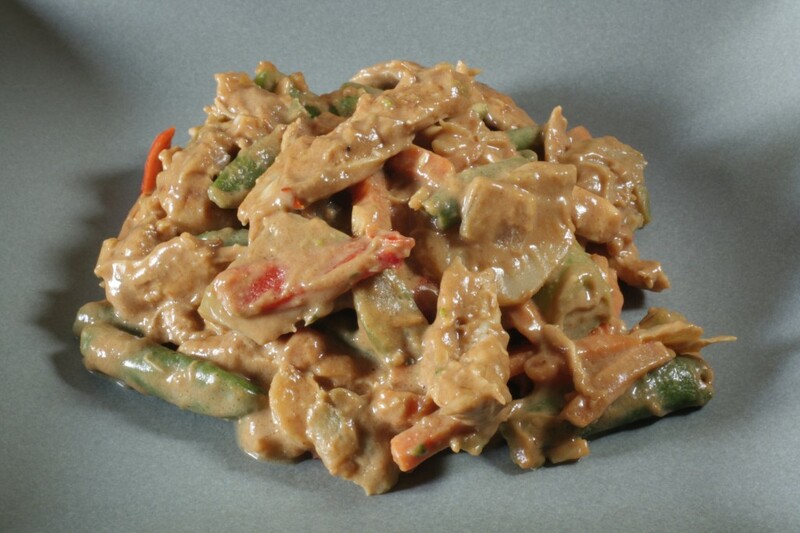 *This dish likely would have turned out better with the noodles, as the peanut sauce would have been covering more food, and the noodles would have absorbed a little of the sauce. Then again, I didn’t like the flavor of the sauce, and I don’t think noodles would have helped that. Mmmm, look at it swimming in that peanut sauce…love peanut sauce. Looks awesome. You know I love peanut butter but I can not stand it when it’s mixed with chicken. They eat chicken satay here with peanut sauce like crazy and they even dip their fries in it..their fries!!! Belated congrats on your 100!! I have yet to find a go to peanut sauce too. Ill be checking back for the other replies. Sonya, the fries thing is way too out there for me. I’m not one to dip fries in mayo, either. I drown them in ketchup though!